Chestnut Hills cottage is a charming, well appointed escape from city life. 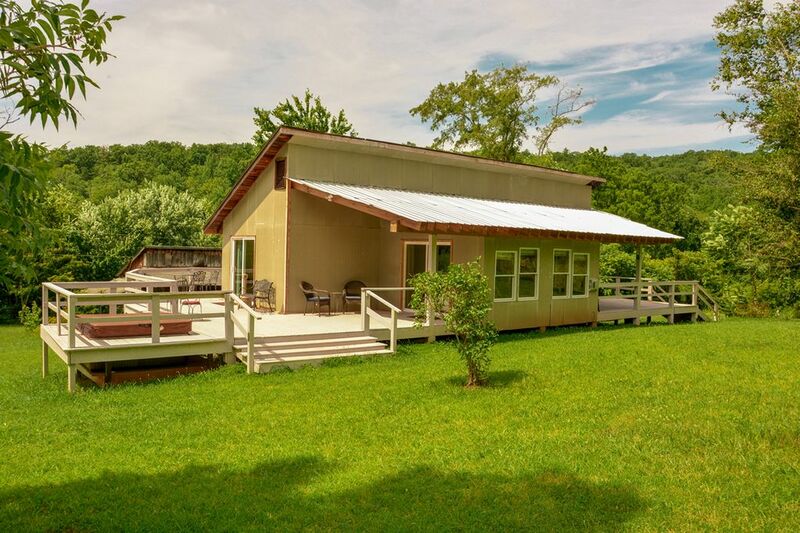 Located just minutes from Shenandoah National Park and Skyline Drive it will serve as a tranquil home base for visiting wineries and exploring the Shenandoah National Park. Wrap around decks, a private hot tub, king size bed, flat screen TV and beautiful natural views will await you, as you arrive to rejuvenate and relax. The Cottage is available for vacation rentals February 1 - December 31 and is closed for the winter month of January. Bathroom includes walk in shower, heated towel bar, quality bath towels. Shampoo, body soap and hand soap provided. Unit features Mitsubishi units to silently heat and cool the entire cottage. gas fireplace located in living room. Parking is adjacent to the cabin. features large flatscreen TV, DVD player, directv, gas fireplace, direct access to wrap around decks. wrap around deck with multiple seating areas and hot tub. Smoking is permitted outdoors only. A covered porch with ash can is provided. When we pulled up the cottage was so welcoming and enviting. The cottage was such a quaint cozy place we were looking for a getaway not to far from home being I recently had a baby so we didn’t want to travel too far and it was my daughters fathers birthday weekend so we just wanted a quiet little getaway. Chestnut Hills Cottage exceeded our expectations from the decor in the house to the oh so comfortable bed and the hot tub were amazing. Every little detail about the cottage was great. The essentials were there from pots and pans down to the silverware and Dawn dish detergent 😊�as we prepared meals so we wouldn’t have to leave, you just need to purchase your food and spices everything else was provided. We will definitely be going back hopefully next time to stay more than two days. It was definitely worth the price as it didn’t break the bank if I may add, it was worth every dollar. Thank you for the Great experience oh and as a side note please tip the cleaning personnel out of courtesy, we of course treated it as if it were our home and left the cottage the same way we entered it but it’s a nice gesture to the cleaning personnel I just thought I’d add that but please if you’re looking for a great quiet place to stay this cottage will not leave you disappointed. From the view, to the home, and the interior it was so welcoming and beautiful. We came for our honeymoon and enjoyed the chestnut hill cottage. It was perfect for a getaway. We had a great time at the Chestnut Hills Cottage. The cottage was very clean and had everything we needed. The bed was comfortable, the linens and towels were very good quality. The hot tub was clean and very relaxing. There is plenty to do in the area. We went to a winery and had dinner at the Bavarian Chef (highly recommended!) and a few places in Charlottesville which is only about 20 minutes away. We would definitely stay here again!